Food and personal care items are needed year-round. In addition to non-perishable items for our food pantry, we also accept local produce from farms and gardens and perishables such as bread, pastries, ice cream and desserts from area businesses. Personal care items, such as toothpaste, shampoo, shaving cream, soap and diapers, are also needed in the Market. For food donations, please remember to check that boxes and cans are not damaged or opened and that expiration dates are not passed. Health and safety regulations prohibit us from accepting foods prepared in private residences or at sites not certified and regulated by the Department of Public Health. Donations are accepted during our normal business hours and by appointment. 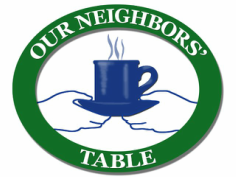 Our Neighbors' Table is open Monday - Thursday from 9:00 am to 4:00 pm, and Friday from 9:00 am to 2:00 pm. For an appointment outside of business hours, please call us at 978.388.1907. Food drives are a great way to make a difference and can be done by people and groups of all ages and sizes. While many food drives take place in the late fall to early winter, we often find our food stock running low in July and August. Hunger is an issue year-round, so consider incorporating a food drive into your summer BBQ! The resources below will help get you started. The Community Food Drive Manual. This step-by-step checklist to help you host a successful food drive. It includes a list of resources and facts about hunger in our community. The School-Based Food Drive Manual. This manual has been tailored to the needs of local schools and provides a ton of useful information to start the conversation in the classroom and move into a real-life impact through a school project. For more information about hosting a food drive, or to let us know that you're planning a drive, contact Lesley Fawcett. Birthday Parties. Ask your guests to bring donated food items instead of gifts. Pick a theme or type of food from our Wish List to give your guests guidance. Interdepartmental challenges. Encourage teamwork and spark a little competition among your employees! Set a timeline and ask each department to focus on a particular food category. The winning department gets an extra hour for lunch or a tour of the food pantry. Holiday Drives. People love to give around the holidays. Ask your friends to pitch in to help spread holiday cheer to those in need. Student Projects. Whether they're studying nutrition, economics, or culture, food relates to just about every topic studied in school. 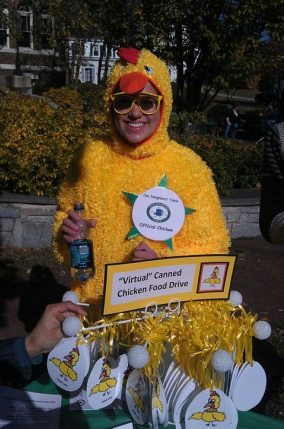 Students can apply their learning to real life by collecting food and helping others in need.